Flippin' heck, it's pancake day! Did you all make your pancakes yesterday? I haven't made British style pancakes since last year's Shrove Tuesday, and I must say that my Mum would have been proud of my wafer thin efforts! 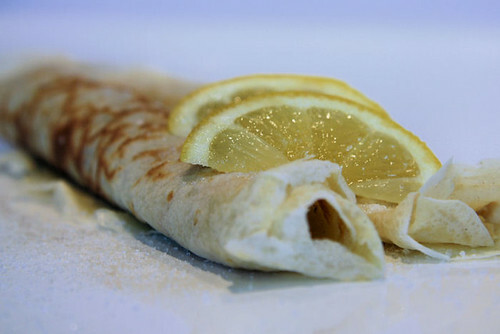 We always have them with freshly squeezed lemon (loads) and sugar (loads) sprinkled on top, then rolled up with a bit more sugar. Well it's only once a year! Actually, having said that, I'm not going to leave it that long before making them again. 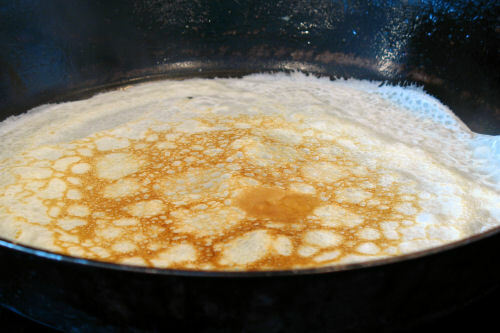 I use Delia Smith's pancake recipe and it gives perfect results every time. Use an old, well seasoned, heavy cast-iron pan - mine was bought for my husband by his Grandma (that's old) - and use only for pancakes, nothing else! It's easier to pour the mixture from a jug, rather than ladle it into the pan. That way you can swirl the pan with one hand, while pouring the mixture in with the other, and you get really thin pancakes. Make sure that you are on your own, because you will look like a total prat. Put camera on a tripod and set the timer up to take at least 4 photos one after the other. Then flip like crazy and pray that you get one decent one out of the millions that you end up taking! After going through the photos, notice that your kitchen is like a bomb site and as there's no way you want anyone to see the cr@p that's on the work surface - you have to blur out the mess with Paint Shop. 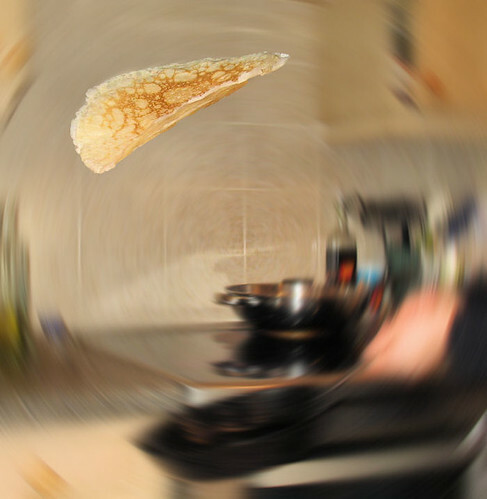 Keep the pancake in focus while you swirly blur and take note that tomorrow you ARE going to CLEAN up the kitchen!!! Here is a photo that shows the inside of the chocolate hearts cake, that post has been updated with the photo. Recipe coming soon! Chocolate - it's the law! 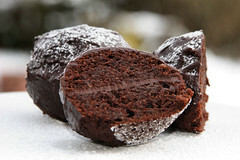 Yep, you've got to have chocolate today - any kind, it doesn't matter, but you have to have some. I don't do cards, presents or flowers. 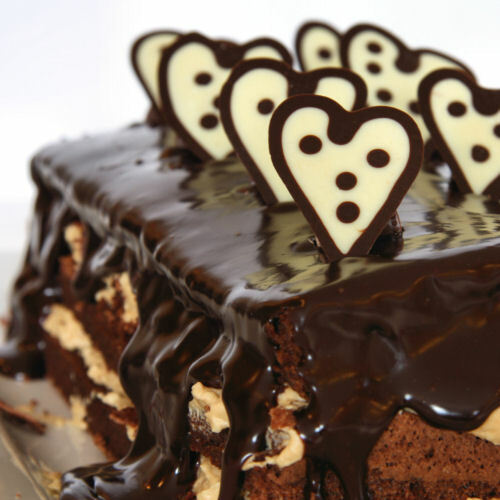 I'm not lining someone else's pockets on Valentine's Day, but I have made a cake, choc full of choc! 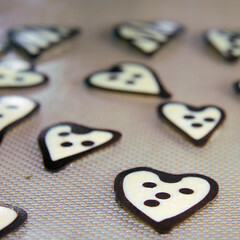 To make chocolate hearts, pipe dark chocolate onto Silpat sheets or non-stick baking parchment, in the desired shapes. 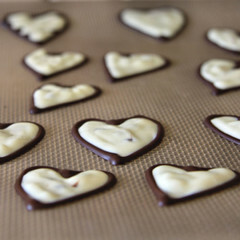 Wait until set and then pipe over the white chocolate, filling up the gaps. When set, peel off and use as wanted. Thank you to the people at the Foodie BlogRoll for randomly selecting me for last month's membership milestone reward. I received a beautiful apron with the Foodie BlogRoll logo on it - many thanks! If you are a food blogger, make sure you hop on over to the Foodie BlogRoll and join up! 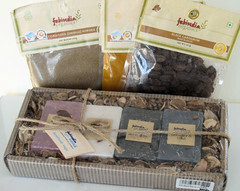 A big thanks to my friend Deeba from Passionate about Baking, who kindly sent me some wonderful spices and soaps. She knows how I love my Indian cooking and I can't wait to get on and make a curry! Thank you so much Deeba!! If you are a food blogger, you will have heard that Blogger Aid is publishing a cookbook!!! Ivy of Kopiaste, Giz of Equal Opportunity Kitchen and Val of More Than Burnt Toast are the organisers of this huge fundraiser and all they want is a recipe from YOU! Here is a teaser of the one I have sent in, Raspberry Mascarpone Bites. For this recipe and recipes from the other participants, you are going to have to buy the book when it is published later in the year. The great news is that the deadline has been extended until March 31st, so you still have some time to get that original recipe sent off to Blogger Aid. 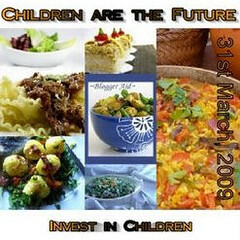 The deadline for the recipe submissions is the 19th March so they can be shortlisted for the show which is taking place on the 28th-29th of March at the ExCel London. All finalists will receive free tickets for the event so that they can come and sample some of the best food, prepared by top chefs from across Britain and Ireland. Top prizes are being provided by exhibitors at the show who offer the most sort after domestic holiday experiences. Anyone can create a simple video recipe and upload it to the Internet. All you need is a video camera, (those on phones and digital cameras are fine) and a computer with an Internet connection. To participate simply go to Look and Taste http://www.lookandtaste.com, sign up. Then follow the instructions to upload your video. Include BestofBritain09 or BestofIreland09 in your title followed by the name of the recipe to automatically enter it into the competition. 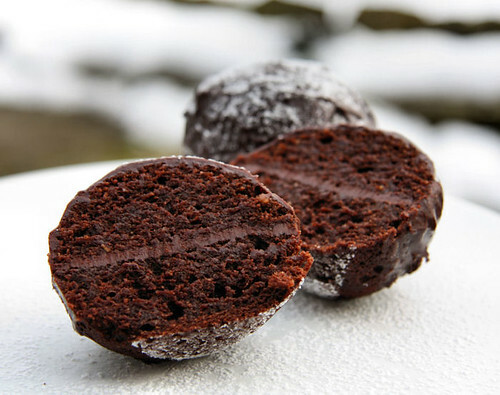 Nutella Snowballs for a Snow Day! Yay! We got snow!! Loads of snow!!! It's so beautiful - I LOVE IT! 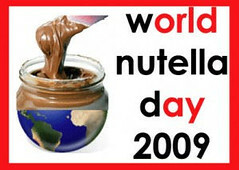 Today is "World Nutella Day 2009" - a day to celebrate, to get creative with, and most importantly, to EAT Nutella! As I love Nutella (not as much as I love snow) I thought I would make Nigella's Nutella Cake. Instead of a large cake, I halved the recipe and made use of some small silicone molds that have been hiding at the back of the cupboard. 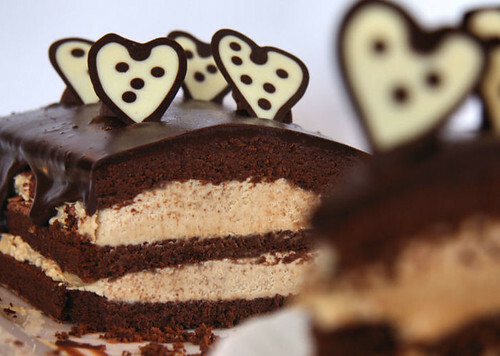 This resulted in little half spheres of cake, sandwiched together and coated with dark ganache. Dust with icing sugar and run into the garden to take a pic - well, we do have SNOW! The recipe is on Nigella's website: Nigella's Nutella Cake, and can also be found in her book, How to be a Domestic Goddess.I cut the recipe in half and that made about 6 small cakes. Sara from Ms. Adventures in Italy and Michelle from Bleeding Espresso will be posting a round-up of Nutella recipes, photos and everything Nutella on Monday 9th February. 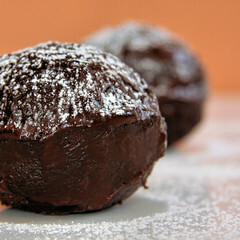 World Nutella Day has even got it's own website, with links to recipes from past Nutella World Days.